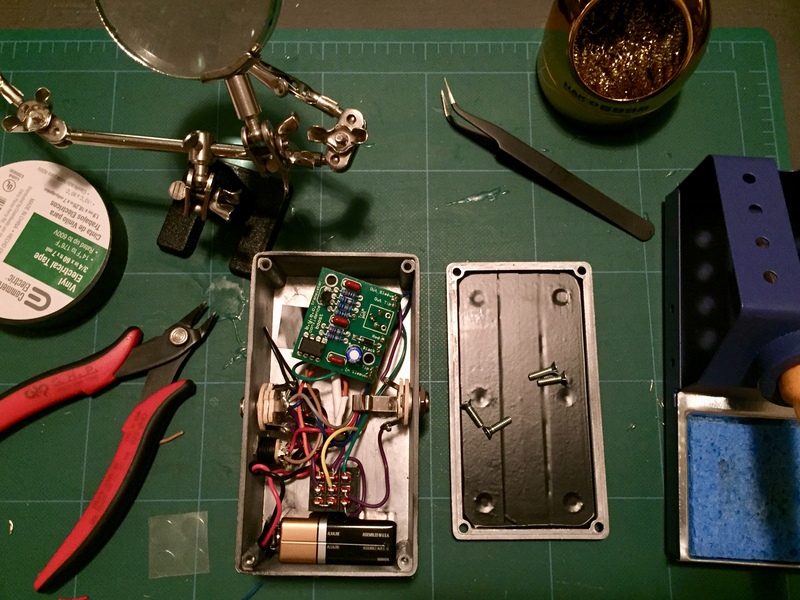 For my birthday, I decided to work a completely new project: build a guitar effects pedal. 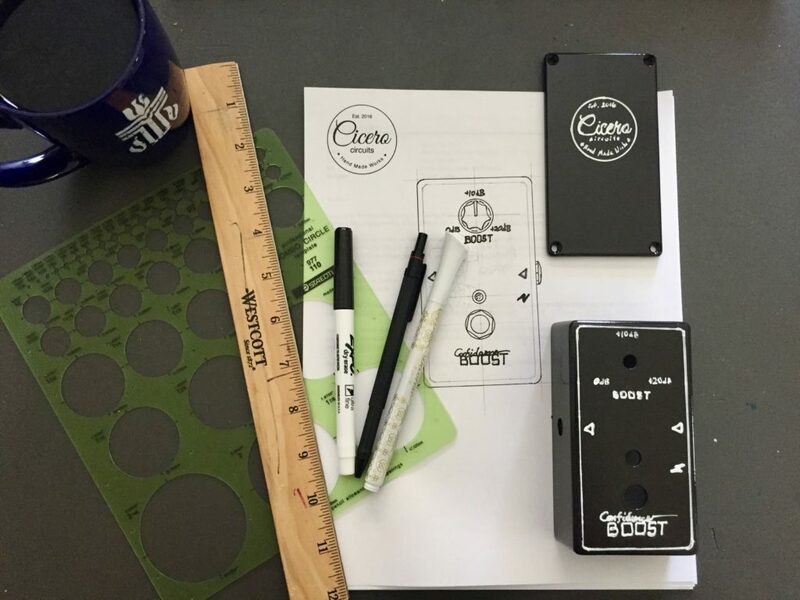 I purchased the “Confidence Boost” project kit from BuildYourOwnClone.com (as in clones of popular guitar stomp boxes). 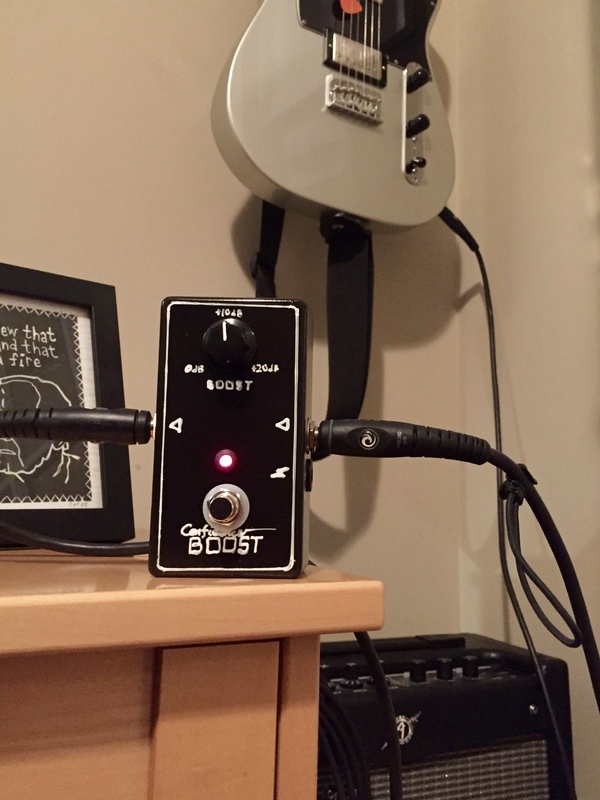 It’s a great project for about $15 which comes with detailed instructions and makes a pretty decent little boost effect. The kit itself only comes with the printed circuit board, electronic components, and off-board wiring such as jacks and potentiometer. I soldered up the components and off-board wiring and plugged-it up. And nothing. It didn’t make any sound! I posted a couple of photos to the discussion board and quickly got a response: the input jack was wired backward. In other words, the signal from my guitar was just going to ground and nothing was going on to the effect (or amp). I quickly re-worked the input jack and it worked. The tiny potentiometer (blue screw driver knob in the photo above) was a bit tough to use. I decided it would be fun to go ahead and wire this up as an actual stomp box, so I ordered a few more components and an enclosure. I spent some time painting and finishing the enclosure. I just used a white pen to draw out the labeling, but it turned out just fine for this project. I read up on how to wire a footswitch for true bypass (when it’s off, it doesn’t affect the signal at all) and with an LED indicator light. But of course, it only really matters how it sounds. I’m far from a capable guitar player and even worse when trying to film my playing, but here’s a small sample.